Here is our team of dedicated professionals providing you with the full range of construction expertise and experience from inception to completion. Throughout the years, JD Painting and Decorating, Inc. has developed the reputation as the highest quality service contractor with trained staff and the capacity to provide you with the necessary services to meet your needs. My name is Jaime Dominguez and I am the Owner and President of JD Painting & Decorating Inc. My dad was a painter and I grew up surrounded by people within the industry. I’ve been a part of this company since my father started it 3o years ago and was fortunate enough to have been groomed and mentored by the some of best in the trade. It is with great honor and gratitude that I am able to hold this leadership position and to continue this legacy and further expand on the solid foundation and structure that was built by my father. One of the challenges we’ve had in growing over the years and being spread out among the various islands, was being consistent in how we do things and who we are. We have strategically incorporated systems and cultivated a culture of service and compassion for both our employees and clients. I look forward to the opportunities which lie ahead and look to further build and lead our team to a fulfilled and enriched life. One in which they are able to be the best that they can be, provided for their families, help our community and have a purposeful life. No matter where we are today, we are blessed with the opportunity to be able to push forward and Finish Well. I look forward to strengthening our existing client relationships and establishing partnerships with new ones by continually learning what their specific needs are. In addition to working, I find great joy in spending time with my amazing wife and raising our two sons. Also like to sneak in some golf whenever possible. 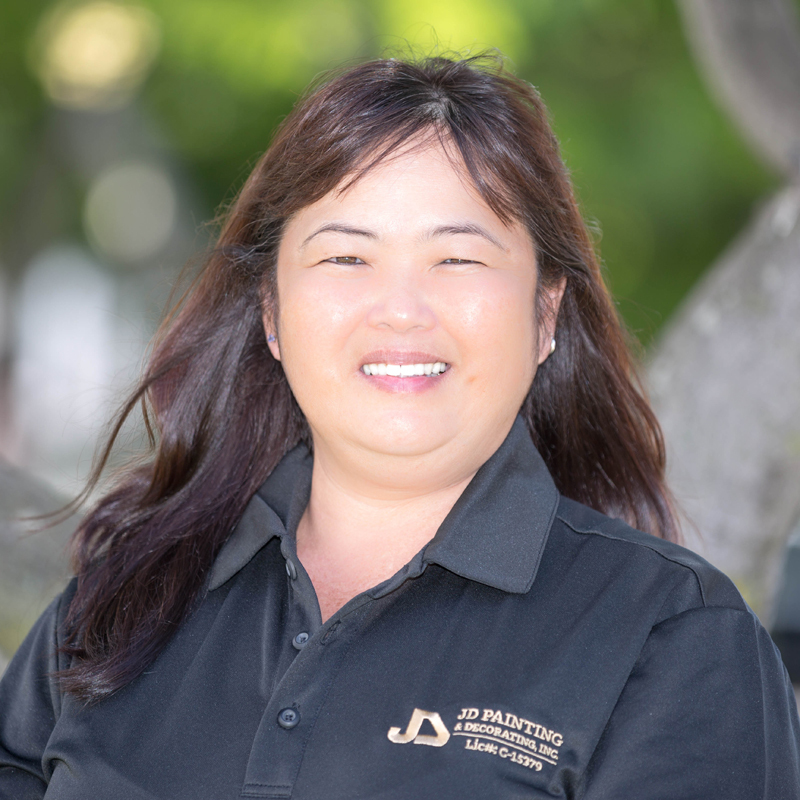 My name is Jaymie and I have been part of the JD family for 10 years. I love being part of a company that is committed to servicing its clients as well as treating its employees and family members with respect and love. I enjoy cooking healthy food for my family and nurturing our boys to become loving and compassionate young men. Hello, my name is Mike. I have been in JD Painting’s Accounting department since 2014. As the Controller, we do our best to support operations and our clients. My office is on Oahu, but we are happy to assist with all jobs at any location. My experience includes CPA and finance. I have enjoyed working with SEC companies, hospitality operation & development, residential and commercial real estate clients. During my time off, I enjoy family time as well as fishing and golfing. I look forward in getting to know you. Let’s work together and complete a project we can all be proud of. 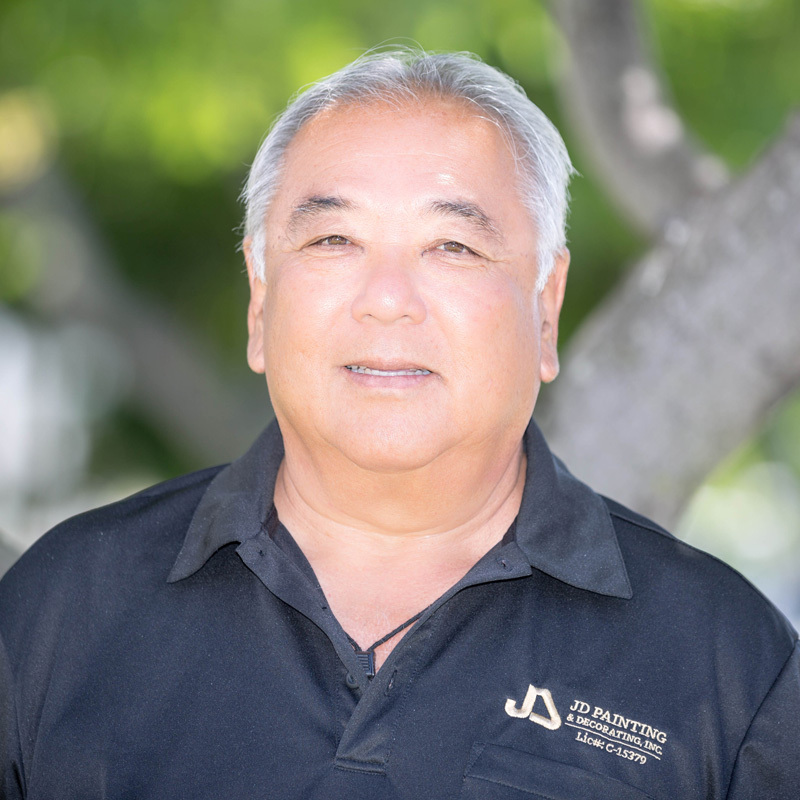 Hi, I’m Grant Umeda, project manager at JD Painting & Decorating, Inc. in Oahu. I’ve been working in the painting industry for 22 years starting as a painter’s helper back in 1995 and advancing through the ranks of apprentice, journeyman, and foreman. Transitioning from the field to management was an interesting change and it offered me a chance to learn more about estimation, time and employee management, and interacting with clientele. Over the years, I have overseen a variety of projects which include architectural painting, high-performance coatings, deck coatings, waterproofing, and other specialty coatings. I enjoy new challenges and have a sense of fulfillment when I can come up with solutions to our client’s problems. During my off-time, I enjoy spending time with my loving wife and two sons, working on my truck, and if time permits, going to the beach. 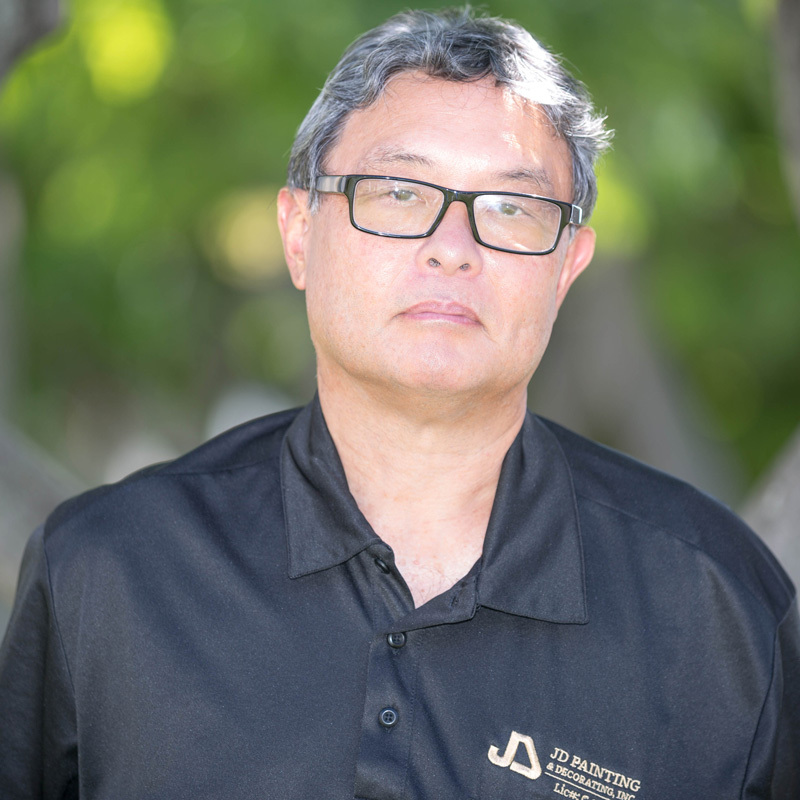 Hello, my name is Sheldon Ibara and I am the Business Development Manager for JD Painting. I started my career in the painting industry in 1998, the majority of which I worked in sales and marketing for a global paint manufacturing company. 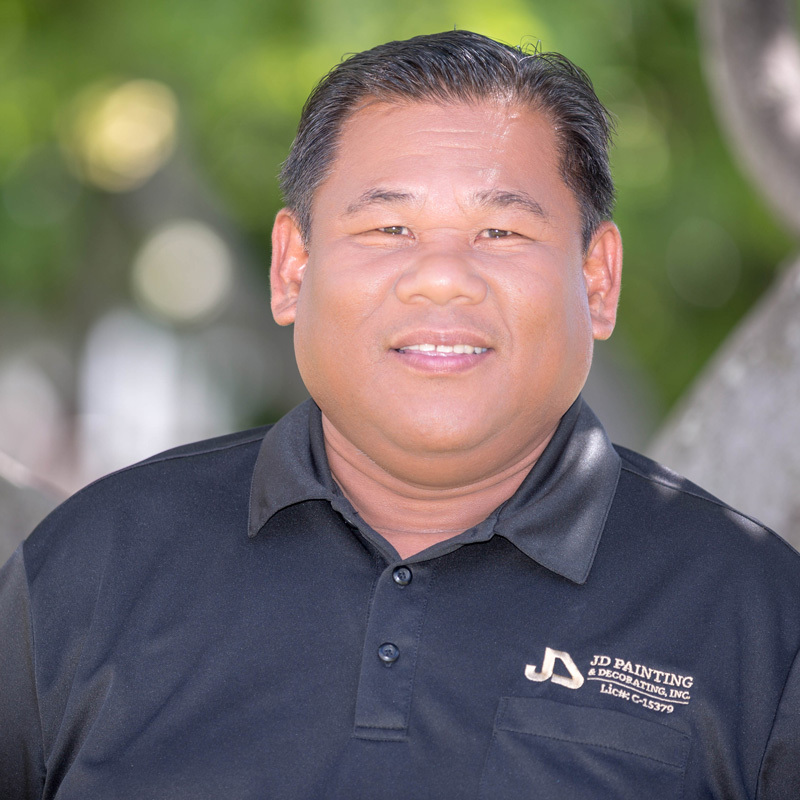 As a BDM, my primary responsibility is to develop new relationships with people, while promoting JD Painting’s core philosophy on every project to Finish Well. My personal goal for every client is to become their Trusted Advisor; being someone that they can count on to understand their business portfolio and to provide whatever support I can to help facilitate their painting needs. On my days off, I enjoy going hiking, swimming and playing family board games with my wife and son. 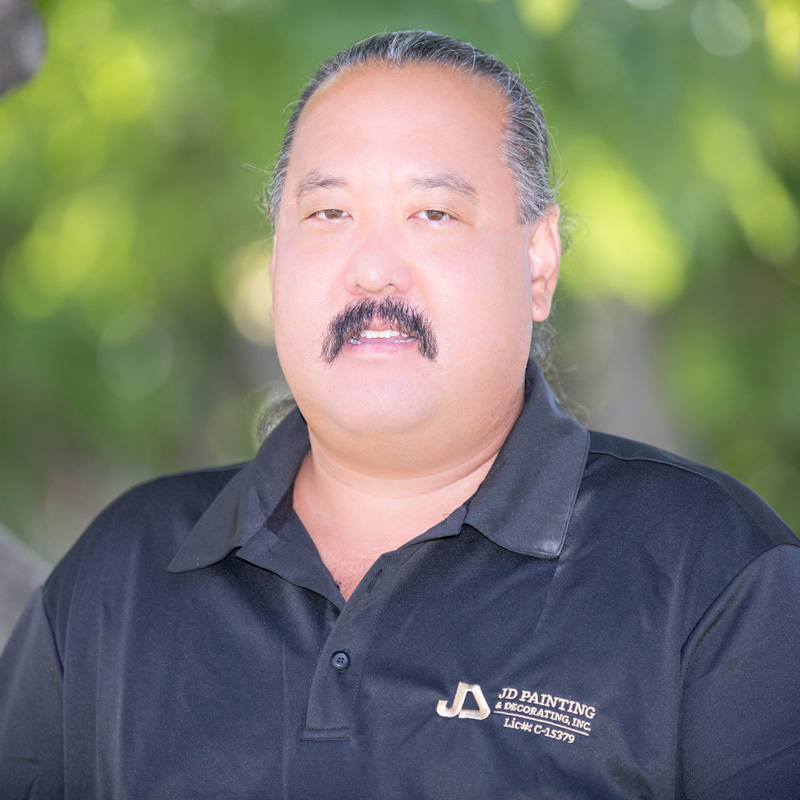 Aloha, my name is Wayne Miyasato, estimator for JD Painting in our Honolulu office. I started with the company in June of 2001. My career in painting started back in 1976 when a friend asked me to work for him because he was starting a painting company. I started as apprentice, became a journeyman painter and eventually estimator. I have done a little of almost everything in the trade from working on repaints, new residential work, commercial projects, tenant improvement as a painter and now estimating them. With my experience in almost all types of painting I do a lot of budget pricing for projects also. Seeing a project from drawing board to reality is something that really excites me and motivates me to look forward the next project, big or small. When you can see the completion of someone else’s dream or vision be turned into reality, it’s awesome feeling to be part of it. When I’m not a work, I’m usually helping out at church, setting up for Sunday services and attending bible studies at least once a week. Hello, my name is Jay. I am an estimator and have been with JD Painting for 5 and half years. My experience in the industry was first as a summer helper for 5 years with AC&L Painting and then with my family owned company for 26 years. In that time, I learned and experienced the ups & downs of the business and importance of relationships between office, field, General Contractors /owners. When I joined JD Painting, I was deeply impressed with the quality and professionalism of the field and how everyone on the Company supports each other to get the job done in a timely and professional manner without cutting corners. Everybody is part of a team and will do whatever it takes for the common goal. When not working, I spend time with my wife traveling, going to events, golfing and washing clothes. 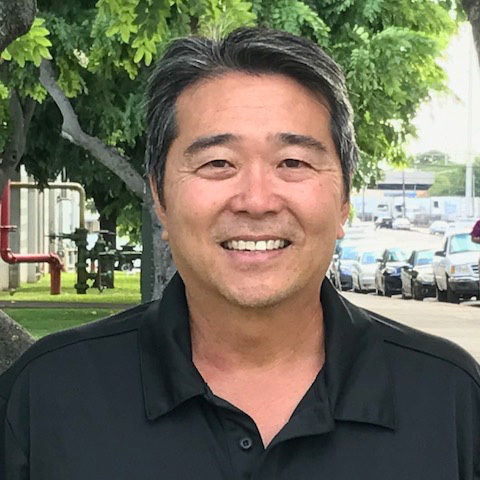 Hi my name is Kurt Nozaki , and I have worked in the painting industry for 20 years. I currently work out of the Oahu office. I have experience in estimating, project management and field supervision. I really enjoy helping people with questions and possible solutions to problems. I believe in having integrity and apply this to my personal and business lifestyle. With my experience and lifestyle, I feel this will help to develop and maintain relationships between clients and JD Painting. In my spare time, I enjoy traveling, golfing and spending time with my girlfriend. 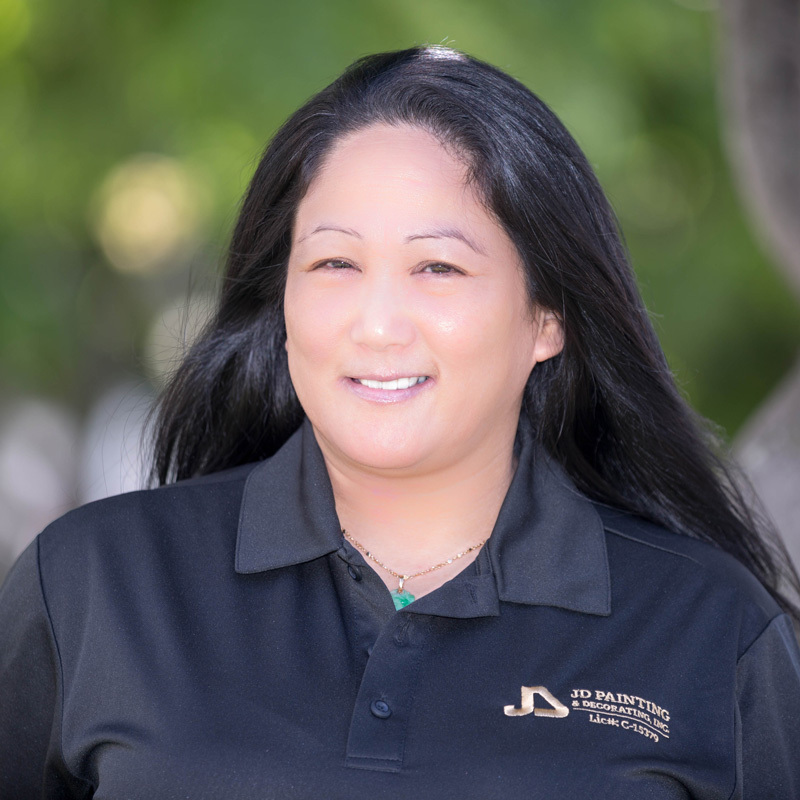 Hi, my name is Sandy and I have been at the Oahu Office of JD Painting for the past 5 years. 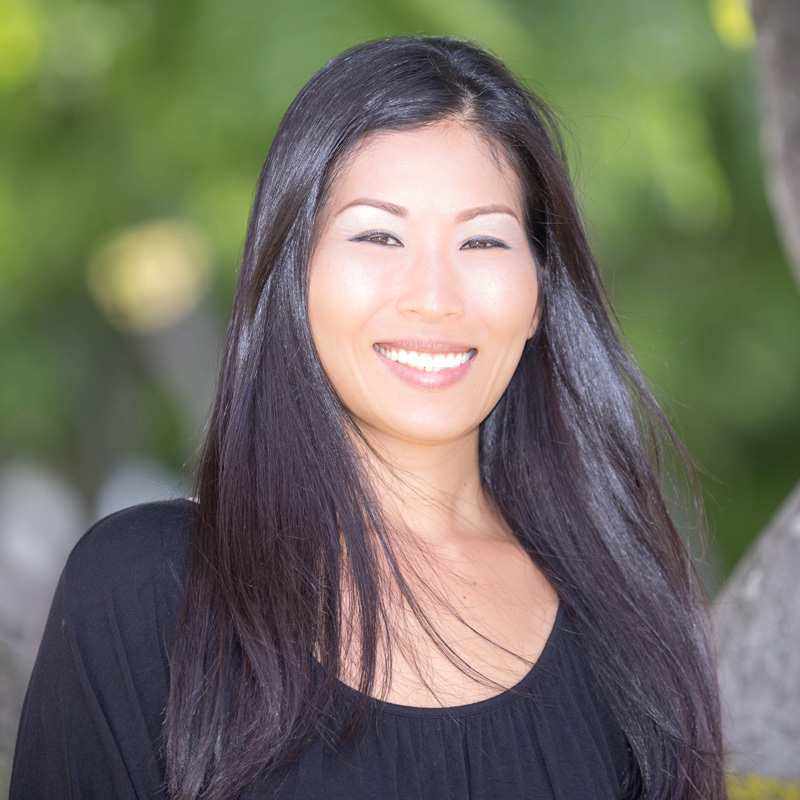 I started here as an administrative assistant and a few years later was blessed to be offered the accounts payable position for Oahu, Maui, and Kauai offices. I make sure that the material costs are accurate, bills are paid on time and in part making sure work can be started on schedule. I am always willing to help and assist no matter what the situation. We all rely on each other to work towards one goal, which is to provide the best service from start to finish. I feel very honored to be working with everyone here. When not at work my husband and I can usually be found doing home improvement projects at home and carting around our teenage daughters. Aloha. 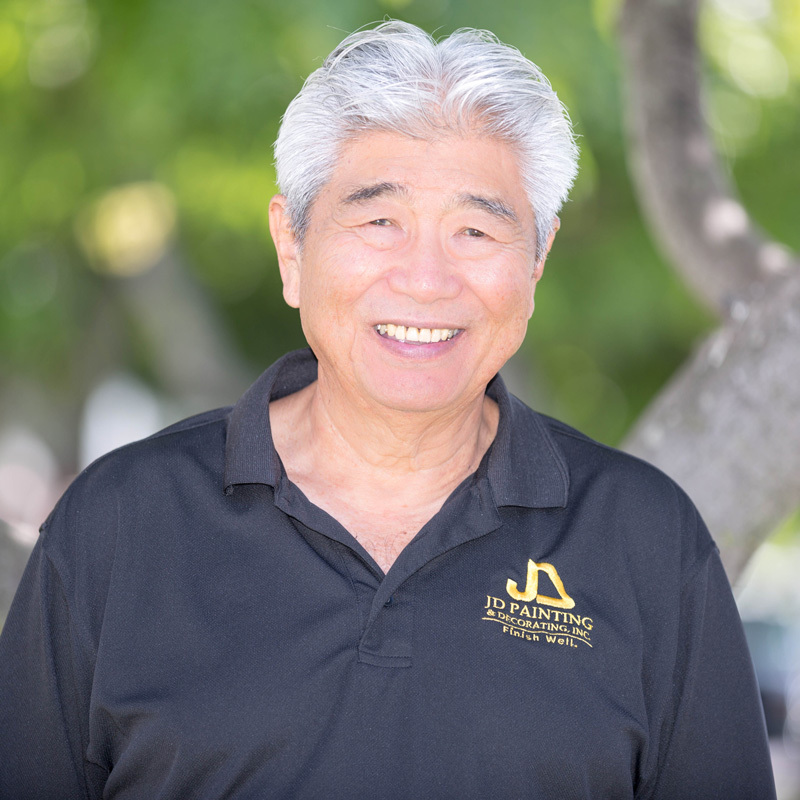 my name is Clyde and I’m based out of our Maui office and travel to other islands if needed. I’ve been in the construction industry for over fifty years and with JD Painting for sixteen years. My commitment to doing what you promise and doing things right has helped me develop long term relationships and trust with our clients. Experience in project management, field supervision and estimating help me provide our clients with solutions to projects. When not working I enjoy travelling with my wife and my family. My favorite pass time is spending time with my grandchildren. 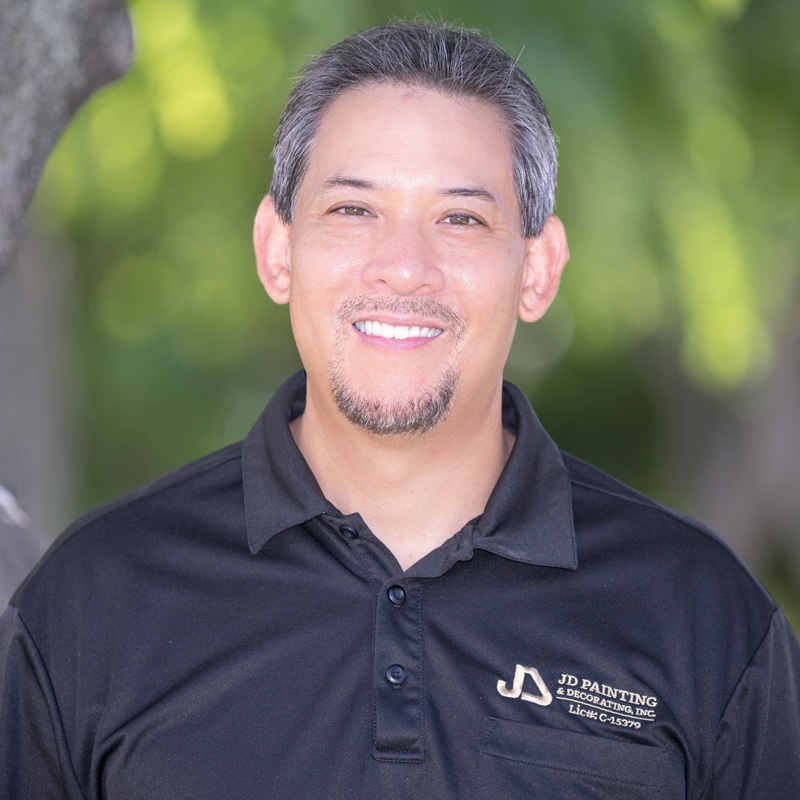 My name is Efren I’ve been with JD painting for 27 years as a journeyman painter and have been supervisor/project manager for the past 20 years. Throughout my years in the field I worked on all the islands doing painting, industrial coating and waterproofing. I’m based and live in Maui but will go wherever the company needs me. I like to help or teach our younger generation (painters or anyone) anyway I can to improve themselves and also willing to learn from them. Spending time with my wife is what I like to do when I’m not working. Aloha, my name is Jeff. 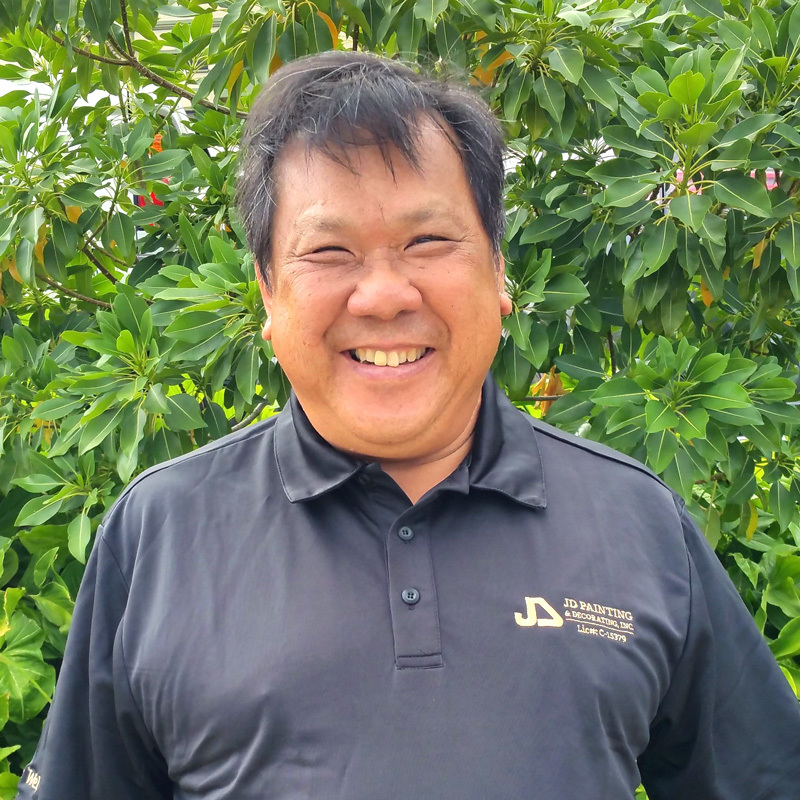 I have been with JD Painting for a total of 7 years and I am based out of the Maui office. My primary role is an estimator but I also assist with project management if needed. My broad range of employment experience includes retail paint/warehouse, fisheries (management and aquaculture) and hospitality management (Las Vegas and Hawaii). On my free time I enjoy being around the ocean, fishing and free diving if I’m not out travelling the world. Aloha, My name is Dennis. 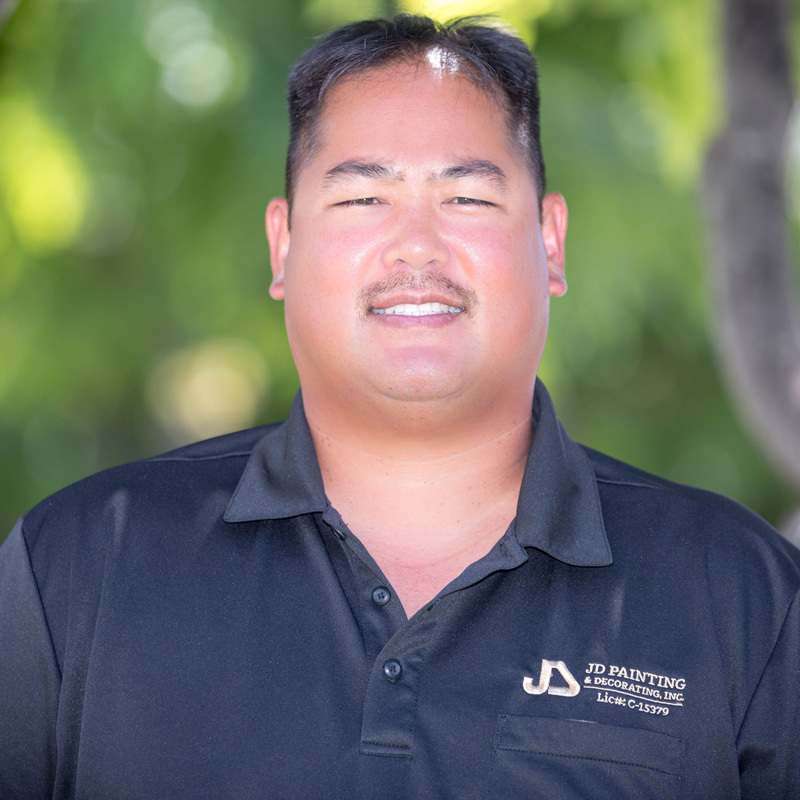 I’ve been with JD Painting for 6 years, prior to JD I worked for two other Hawaii painting contractors for 18 years, and I was involved in estimating and operations with a mainland Painting & Decorating contractor for 17 years. 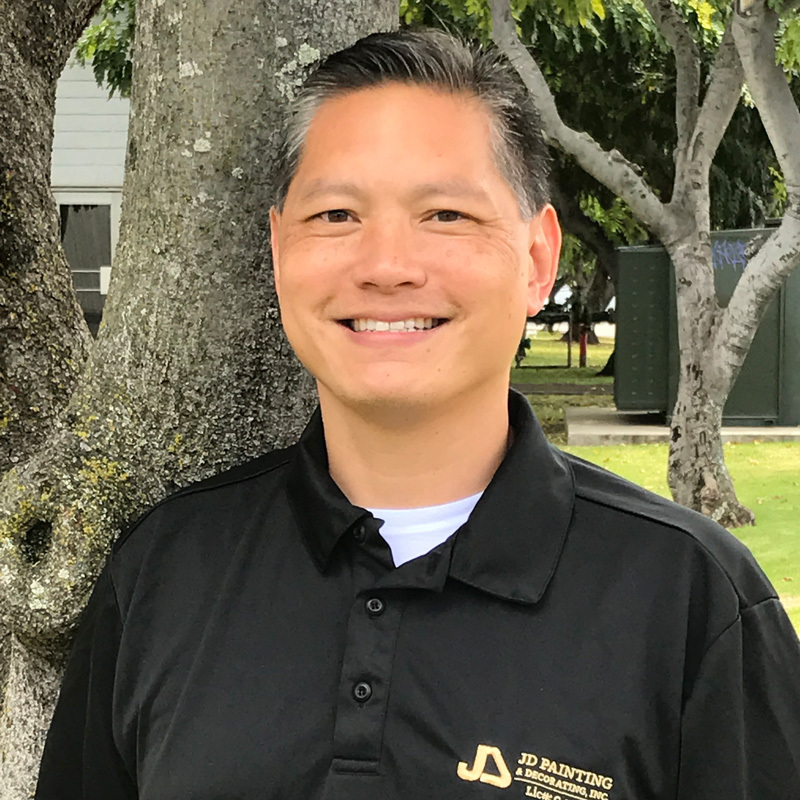 I’m an estimator and project manager based in our Maui office but I work on projects statewide. I am a graduate of Towson University with a background in Business Administration in Construction & Design. My objective is to provide a quality finished project at competitive prices. My goal is “complete customer satisfaction” by working closely with new and existing clients from start to finish to deliver a top class project within budget. In my free time my passion is traveling. I’ve traversed the world several times – visited six continents and multitude of countries and many more to explore. I also like to enjoy the beautiful outdoors that Hawaii offers with beach time, hiking and gardening. Aloha! My name is Jayne and I have been with JD Painting for 20 years. I started with JD Painting when the office and staff was much smaller. Over the years this company and staff has become family to me. I enjoy working with people and in my role as payroll manager; I enjoy getting to know our employees in various capacities both personal and professional. Keeping them happy has been my goal. Originally from the Big Island, I moved to Maui in 1986 and have raised my family here and made Maui my home. I enjoy traveling to visit my children in Nevada and Oregon and I have 3 of the cutest fur babies to keep me company. My name is Rodney Shishido. I am an accountant at JD Painting and primarily assist other team members with any needs. I have worked at various companies focused primarily on the daily tasks of accounting. Outside of work, I am an outdoor enthusiast – avid hunter and fisherman. 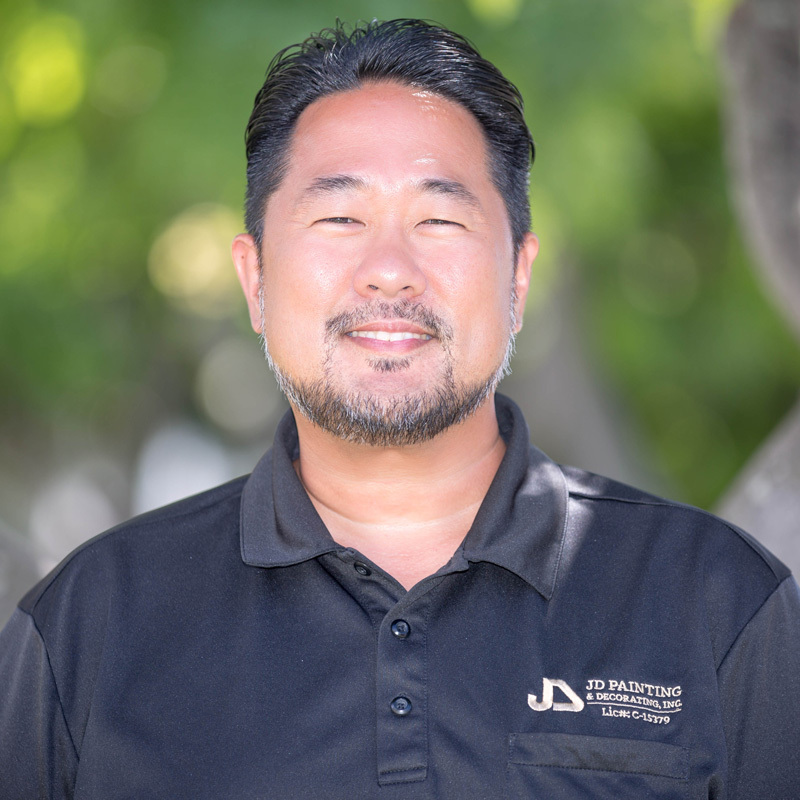 Aloha, my name is Lee and I have been with JD Painting for 17 years. In 2000 I started with the company as a journeyman painter. 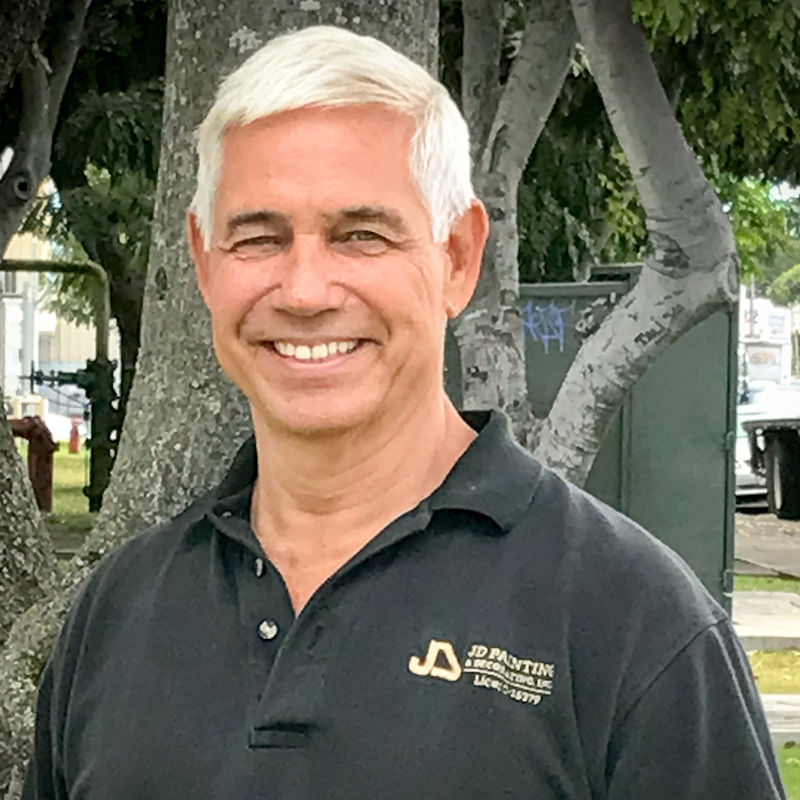 I had already had 13 years of experience working as a painter for a small Kaua‘i company so starting with a larger company was a new and exciting experience for me. In 2005 I became the Kaua‘i Operations Manager for JD Painting. I enjoy working with and managing the crew on Kaua‘i. We take pride in our work and in completing projects in a timely and professional manner. 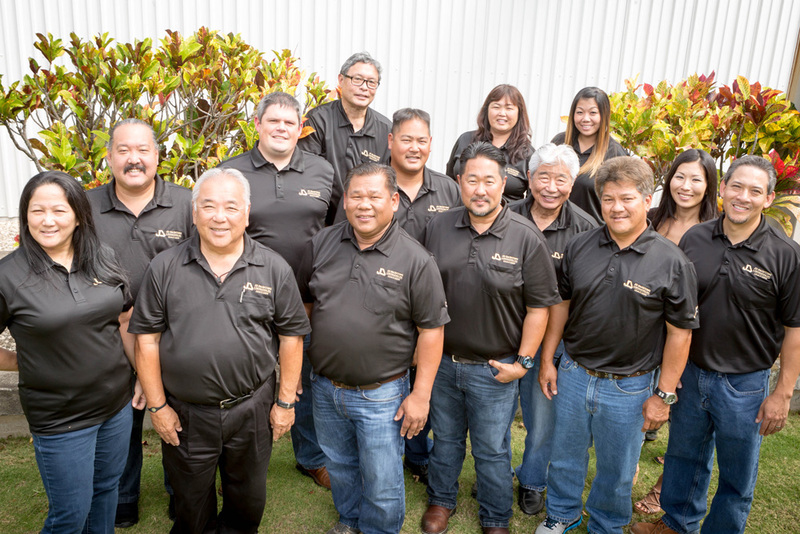 Being born and raised on the small island of Kaua‘i we know how important it is and make it our priority to build strong lasting relationships with our customers. When not at work I volunteer a lot of my time to youth sports, coaching both baseball and basketball. In my spare time I enjoy fishing and playing basketball. 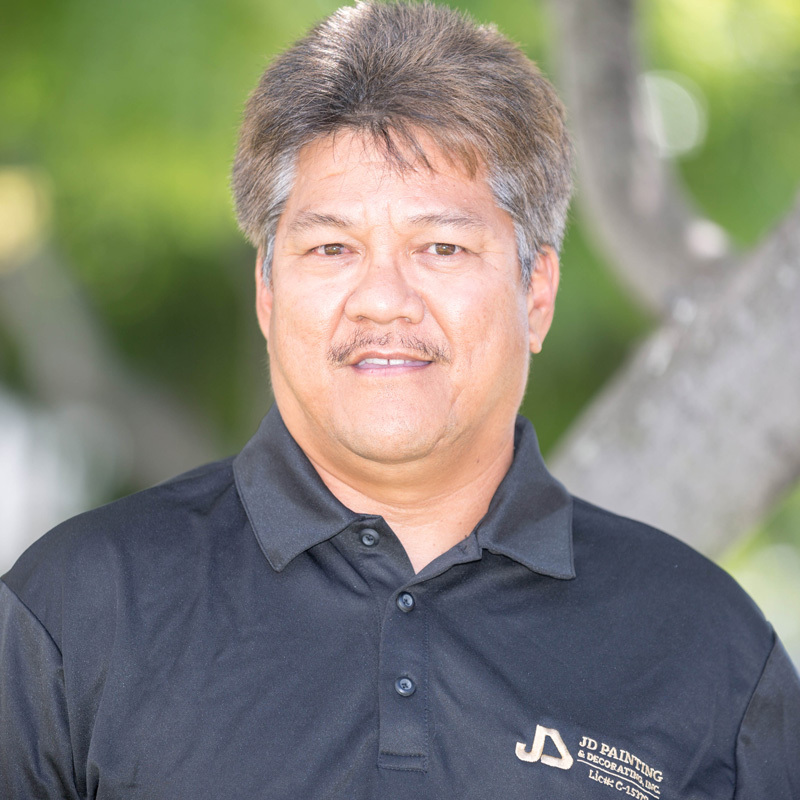 Aloha, my name is Craig and I have been with JD Painting as the Safety Coordinator for the past 11 years. 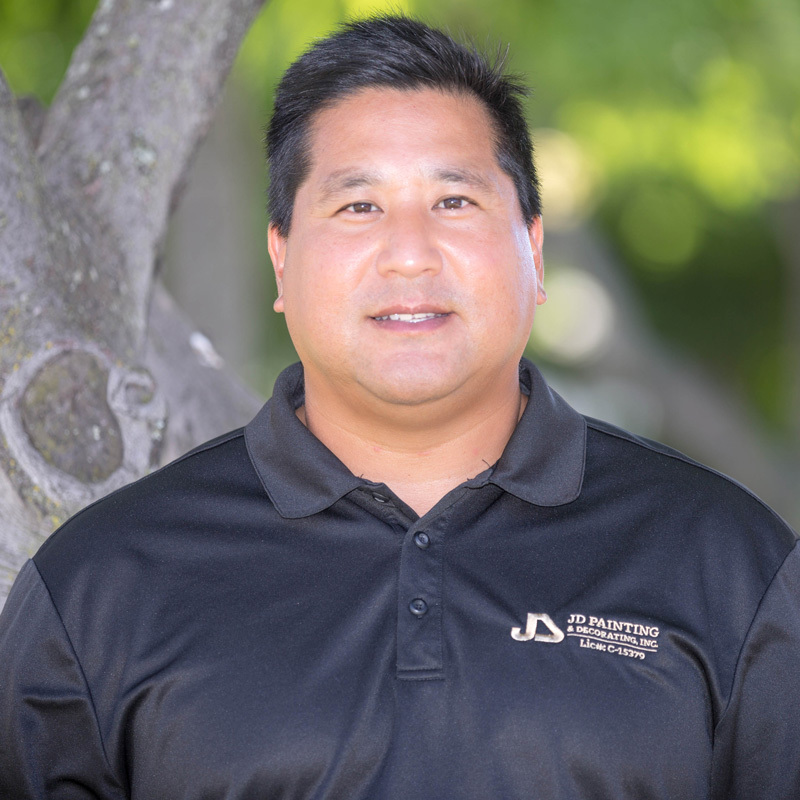 I have a total of 15 years’ experience in the safety field and hold an Associate’s degree in Occupational, Environmental Safety & Health as well as a Construction Health & Safety Technician Certification from the Board of Certified Safety Professionals. During my 11 plus years working with JD Painting, we have been able to build a Company Safety Program that is responsible for lowering our recordable incidents from 14.97 in 2005 down to an average of 4.5 over the next 11 years. The experience and knowledge that I have gained over the years has helped me in managing various types of projects ranging from, 40 story suspended scaffolding work to confined space fuel tank entry work. When I’m not at work, you will find me at the beach swimming/fishing with my kids or on the softball field working with female athletes to improve their softball skills.